The GMAT is not a test you can cram for. There is simply too much material to cover and too much practice required. Expect to spend at least 100 hours on your GMAT preparations, over the course of four to ten weeks. Ideally you should prepare for the GMAT well in advance of business school application deadlines. Also choose a time period that is clear of major work or personal time commitments. You need sufficient time each week to study without other stressors impacting your study time or concentration level. Furthermore, select a time period that will allow for continuous studying without an extended break, because students tend to start forgetting material and approaches in as little as one week without continuous reinforcement. As you embark on your GMAT journey, the first step should be to establish a basic familiarity with the GMAT and its question types. The next step is to take a diagnostic test to determine your current scoring potential and to better identify your strengths and weaknesses. For this, we recommend the free official GMATPrep software. Although GMATPrep contains only two tests (not counting the paid Exam Pack 1 add-on), and some companies therefore suggest that you save both tests for later, we see no harm in taking one of the tests early on. You can retake the test later and will probably see mostly different questions on this adaptive test because your skills will have improved. Furthermore, you will have done so much practice before retaking the test that you probably won’t remember repeat questions. At this point, you can decide what preparation option will work best for you. Think carefully about which preparation method will work best given your development needs, schedule, and learning preferences. Also consider how far away you are from your target GMAT score. To boost your chances for acceptance, we recommend that you target a GMAT score above the median scores for the business schools to which you want to apply. Once you settle on a preparation option, select an offering of the highest quality that matches your learning style. Since it is not efficient to study material randomly and practice haphazardly, develop a focused study plan to help you progress systematically through your GMAT materials and practice content. Your study plan should be customized to your timeframe, skill levels, development needs, study preferences, and choice of preparation options. Your written plan should outline on a weekly basis what you will accomplish in terms of concept review, practice problem sets, diagnostic tests, and practice question review. Your weekly objectives should be realistic and as specific and measurable as possible (e.g. “complete two math and two verbal 75-minute mixed practice problem sets”, not “do some practice questions”). To help keep you on track, have a friend, family member, or tutor hold you accountable to achieving your weekly study objectives. Your study plan should be dynamic, changing as you progress based on new data and information about your strengths, weaknesses, and development needs. Irrespective of which preparation method you choose, extensive self-study will also be required. Attending a course or meeting a tutor is insufficient without self-practice to cement the concepts taught and to apply the concepts to actual problems. In addition to whatever materials come with your preparation option, it is absolutely essential that you practice with retired real GMAT questions using the GMAT Official Guide . Since there is no overlap in practice questions, we also highly recommend the GMAT Quantitative Official Guide and the GMAT Verbal Official Guide . To save money, you can purchase all three books together in the Official Guide Bundle . Although you can concentrate your studies on areas where you need the most improvement, be sure to practice with both math and verbal questions every week. Without continuous exposure and practice, it is less likely that you will retain all the knowledge that you need to excel on each section of the GMAT. We also recommend that students take at least five and up to 12 practice computer adaptive tests (CATs) in advance of test day. Since some third party CATs are a poor representation of the actual GMAT, choose high quality diagnostics (tutoring students receive our recommendations). Plan to take one or two CATs per week, after establishing at least a basic familiarity with the concepts tested on the GMAT. To minimize connectivity issues, we suggest that you take Internet-based CATs on a wired connection rather than a WiFi connection. While you hope to see continuous improvement in your scores as you take more practice CATs, your scores may actually vary, sometimes significantly. There are several reasons why this can happen, as detailed on our GMAT FAQ page. No matter which other CATs you choose, it is critical to use the free official GMATPrep software and the paid Exam Pack 1 add-on. GMATPrep uses retired real GMAT questions and its tests use the same technology as the real GMAT -- identical directions, program controls, adaptive algorithm, and scoring mechanism. Exam Pack 1 provides two additional full-length tests and enhanced score reporting functionality to GMATPrep. Through your use of GMATPrep, you should become intimately familiar with the program controls, test directions, and question formats. As a result, you should not have to spend any of your time or focus on these on test day. Our effective study habits page goes into more detail about how to approach your practice CATs and problem sets. 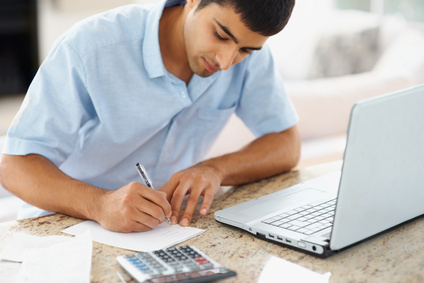 You should be fully prepared for the GMAT a few days in advance of your exam date. The two days before your test should consist only of light review and practice. Avoid intense studying these days so that your mind can recover and to prevent burn-out on test day. In the two weeks leading up to test day, get lots of sleep so that your body is well-rested. Aim for at least eight hours of sleep per night. To get extra sleep, it is much better to sleep early and wake up at your normal time than to sleep in during the morning (as this can leave you feeling groggy). Adjust your schedule to what you will face on test day. For example, if you typically awake at 9 a.m. but have scheduled an 8 a.m. GMAT appointment, you should get used to waking up at 7 a.m. or earlier for at least two weeks in advance. Furthermore, do not introduce any changes to your routine in the days leading up to your exam date. For example, if you are not a coffee drinker, don’t drink a cup of coffee the morning of your test for the caffeine jolt. Also save your celebrations until after the test; a hangover won’t help on test day. On the day before your exam, get everything that you need ready so that you are not left scrambling. Start the day of your test with a high-protein breakfast (e.g. a Sausage McMuffin with Egg from McDonald’s, but no hash browns). If your test is in the afternoon, don’t forget to have a healthy, high-protein lunch (e.g. a turkey and cheese sandwich on whole wheat bread) as well. Plan to arrive at the test center at least 45 minutes before your appointment time, since you are supposed to allow 30 minutes for check-in procedures and you should allow extra margin for traffic and other delays. To minimize an unpleasant surprise, you may want to drive to the test center a few days in advance, using the same route at the same time that you will on test day. The less stress you have on test day, the more relaxed and confident you will feel.